1عضو هیأت علمی دانشکده کشاورزی، دانشگاه هرات، افغانستان. 2عضو هیأت علمی گروه تولیدات گیاهی، دانشکده کشاورزیدی، دانشگاه تربت حیدریه، ایران. 3استادیار گروه تولیدات گیاهی، دانشکده کشاورزی، دانشگاه تربت حیدریه، ایران. 4استادیار گروه تولیدات گیاهی، پژوهشکده زعفران، دانشگاه تربت حیدریه، ایران. 1Faculty member, College of Agriculture, Harat University, Afghanistan. 2Faculty member of Plant Production Department, Faculty of Agriculture, Torbat Heydarieh University, Iran. 3Faculty Assistant Professor of Plant Production Department, Faculty of Agriculture, Torbat Heydarieh University, Iran. 4Professor of Plant Production Department, Saffron Institute, Torbat Heydarieh University, Iran. In order to study the effect of planting density on flower and corm yield of Spanish and Iranian saffron (Crocus sativus L.) types, an experiment was arranged in factorial with randomized complete block design with three replications. This experiment was conducted on the Research Farm of the Faculty of Agriculture, Ferdowsi University of Mashhad in 2013-15. The saffron corm type was considered in two levels (a1: Iranian corm and a2: Spanish corm) and the planting densities were in three levels (d1:40, d2:48 and d3:60 corm.m-2). The two year results showed that the effect of different planting density and saffron corm types on the number of flowers, flower fresh and dry weight (stigma + style) and number of replacement corms were significant (P<0.01) while, the effect of corm type on fresh and dry weight of replacement corms was not significant. The highest number of flowers (30.25 No.m-2), flower fresh weight (15.125 g. m-2) and (stigma + style) dry weight (0.16 g.m-2) were obtained in d2 (48 corm.m-2), respectively. Corm type had significant effects on saffron flower characteristics. The highest numbers of flowers (27.21 No.m-2), flower fresh weight (13.58 g.m-2) and (stigma + style) dry weight (0.144 g.m-2) were obtained from Iranian corms (a1), respectively. However, the highest number (222.83 No.m-2), fresh weight (694.92 g.m-2) and dry weight (270.32 g.m-2) of replacement corms were obtained from Spanish corms (a2), respectively. The years had significant effects on saffron flower and corm characteristics as the highest amounts were obtained in second year (Y2), respectively. Alavi Shahri, H., Mohajeri, M., and Folaki, M.A. 1994. Evaluation of plant density (planting distance) on saffron yield. Proceedings of 2nd Meeting of Saffron and Medicinal Plant Agronomy. Gonabad, Iran. (In Persian). Beheshti, A., and Faravani, M. 2003. Investigation the effect of different planting proportions and densities on yield and yield components of saffron and caraway mixed cropping. 3th national congress of saffron, Mashhad, Iran, 2-3 December 2003. (In Persian with English Summary). Gresta, F., Lombardo, G.M., and Avola, G. 2010. Saffron stigmas production as affected by soil texture. Acta Horticulture 850: 149-152. Gresta, F., Lombardo, G.M., Siracusa, L., and Ruberto, G. 2008. Effect of mother corm dimension and sowing time on stigma yield, daughter corms and qualitative aspects of saffron (Crocus sativus L.) in a Mediterranean environment. Journal of Science Food & Agriculture 88: 1144–1150. Kafi, M., Rashed Mohassel, M.H., Koocheki, A., and Molafilabi, A. 2002. Saffron, production and processing Ferdowsi University of Mashhad Press. 276 pp. (In Persian). Koocheki, A., Siahmarguee, A., Azizi, G., Jahani, M., and Alimoradi, L. 2009a. The effect of plant density and depth on agronomic characteristic of saffron (Crocus sativus L.) 3rd International symposium on saffron.Forthcoming challenges in cultivation, Research and Economics. 20-23May 2009. Korokos,kozami, Greece. Koocheki, A., Tabrizi, L., Jahani, M., Mohammad-Abadi, A.A., and Mahdavi Damghani, A. 2009b. Performance of Saffron (Crocus sativus L.) under different planting patterns and high corm density. 3rd International symposium on Saffron. Forthcomingchallenges in cultivation, Research and Economics. 20-23 May 2009. Korokos,kozami, Greece. Koocheki, A., Ganjeali, A., and Abbassi, F. 2007. The effect of duration and condition of incubation, weight of mother corms and photoperiod on corm and shoot characteristics of saffron plant (Crocus sativus L.). Iranian Journal of Field Crops Research 4: 315–331. (In Persian with English Summary). Koocheki, A., Nassiri, M., and Behdani, M.A. 2007. 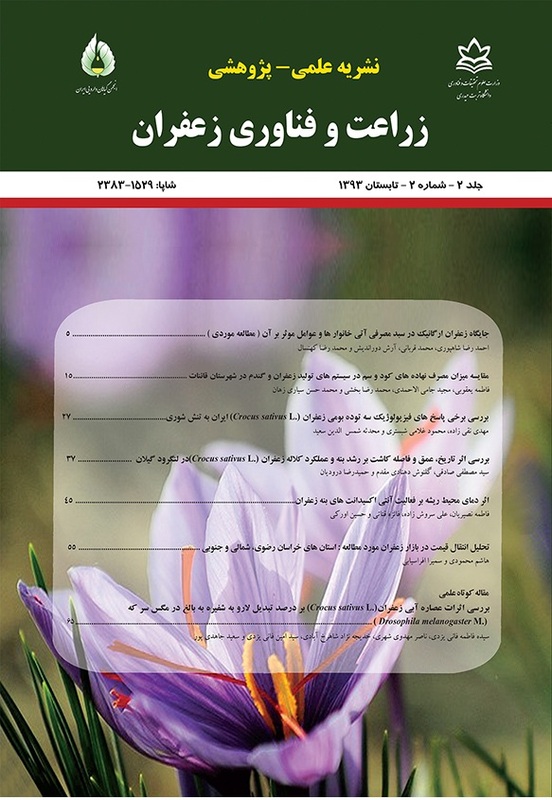 Agronomic attributes at saffron yield at agro ecosystems scale Iran. 2nd International Symposium on Saffron Biology and Technology. Mashhad, Iran. (In Persian with English Summary). Mc-Gimpssey, G.A., Douglas, M.H., and Wallace, A.R. 1997. Evaluation of saffron (Crocus sativus L.) production in New Zealand. New Zealand Journal of Crop and Horticulture Sciences 25: 159-168. Mohammad-Abadi, A.A, Rezvani-Moghaddam, P., Sabori. A.,2007. Effect of plant distance on flower yield and qualitative and quantitative characteristics of forage production of saffron (Crocus sativus) in Mashhad condition. 2ndInternational Symposium on Saffron Biology and Technology. Mashhad, Iran. (In Persian with English Summary). Molina, R.V., Valero1, M., Navarro1, Y., Guardiola, J.L., and Garcıa-Luis, A. 2004. Temperature effects on flower formation in saffron (Crocus sativus L.). Scientia Horticulture 103: 361-379. Naderi-Darbaghshahi, M.R., Khajeh-Bashi, S.M., Bani-Ateba, S.A.R., and Deh-Dashti, S.M. 2008. The effects of planting method, density and depth on yield and exploitation period of saffron field (Crocus sativus L.) in Isfahan. Seed and Plant Journal 24: 643-657. (In Persian with English Summary). Nasiri Mahallati, M., Koocheki, A., Boroumand Rezazadah, Z., and Tabrizi, L. 2007. Effect of corm size and storage period on allocation of assimilates in different parts of saffron plant (Crocus sativus L.). Iranian Journal of Field Crops Research 5:155–166. (In Persian with English Summary). Negbi, M., Dagan, B., Dror, A., and Basker, D.1989. Growth, flowering, vegetative reproduction and dormancy in the saffron croucus (Crocus sativus L.). Israel Journal of Botany 38: 95-113. Rangahou, M.K. 2003. Growing saffron. The world's most expensive spice. Crop and Food Research 20: 1-4. Renau-Morata, B., Nebauer, S.G., Sánchez, M., and Molina, R.V. 2012. Effect of corm size, waterStress and cultivation conditions on photosynthesis and biomass partitioning during the vegetative growth of saffron (Crocus sativus L.). Industrial Crops and Products 39: 40–46. Sadeqi, B. 1993. Effect of corm weigh on saffron flower produced. Khorasan scientific and industrial research organization. annual report: 18-26. (in Persian). Timmer, M.J.G., and Vandervalk, G.G.M., 1973. Effect of planting density on the number and weight of Tulip daughters bulbs. Scientia Horticulturae 1: 193-200.